I’m Cherie Carroll, a professional exercise coach and the owner of Female Personal Trainer Derby. I specialise in working with women to achieve their health and fitness goals. My aim is to help you reach your full physical potential through the use of unique fitness programs designed to keep you motivated and confident. My objective as a personal trainer is to help the women of Derbyshire realise their dreams of becoming leaner, fitter, healthier or more toned – or any combination of these. I have a private training studio called “The Tone Zone” so you will have total privacy unlike a commercial gym. All my female trainer sessions are personalised: tailored to the individual needs and current fitness level of each client. These will obviously change over time, and so my plans are constantly being reviewed to ensure you gain the maximum benefit from everything you do. I’ll be on hand to support and encourage you throughout the whole process, whether it’s just a one-off session to get your exercise regime started, or across a longer time frame. I’m also available to answer any questions you might have about the exercises or equipment. How can Derbyshire personal training help me with my fitness? Whether you’re a Derbs female looking to lose weight, tone up your muscles or simply improve your overall fitness, I can help you achieve your goal. I work closely with local women to set realistic training targets, devise individualised workouts and keep you motivated. I ascertain that every exercise plan can work around your lifestyle and commitments, enabling you to make the most of every exercise opportunity. I will also assess which exercises are suitable for you at the different points along your fitness journey, ensuring you only participate in activities which are going to be beneficial and safe. By working solely with ladies in the Derby area I can offer regular exercise sessions and on-hand support for all my customers, providing a truly personalised experience. If required, I can also discuss dietary options with you, such as foods and drinks to provide vital nutrients, minerals and vitamins. Furthermore, I can provide tips on how to maintain a balanced diet to suit even the busiest of working Derby women. However, it is recommended that anyone with a specific medical condition such as diabetes should always check with their doctor before undertaking a serious exercise or dietary regime. As an exclusively-female personal instructor working in and around the Derby area, all my focus and experience is on what works best for women, giving me excellent insight into how to help you realise your aims as simply and easily as possible. Of course, any attempt to improve your fitness requires dedication, determination and a fair amount of grit – you don’t get something for nothing – but that doesn’t mean you have to go out of your way to create more work for yourself. In each personal trainer session, I concentrate on giving you exactly the right combination of activities and duration to maximise your success; as long as we can work together and both put our best efforts into the endeavour, there’s no reason why even the most ambitious of goals can’t be achieved over time. I’m a Derby resident looking to shed a few extra pounds. Is using a female personal trainer the right option for me? 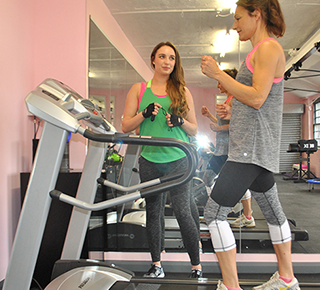 Many women who struggle to find the energy, time or motivation to maintain regular gym attendance find a personal instructor is the best option for them, as someone else is there to prompt and push them when their own energy level, mood or inclination is low. 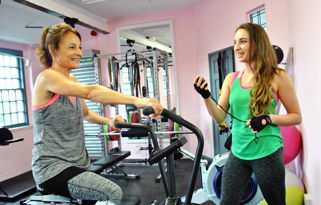 If you’re a female in the Derby area and are finding it difficult to stay motivated about your fitness, it’s definitely worth considering a personal trainer. Furthermore, as a female-only coach, I’ve developed an outstanding knowledge of the needs and behaviours of the female body, allowing me to shape my exercise regimes to suit a feminine style of fitness, so you know you’re getting a personalised plan of the highest quality. What goal will your trainer help you work towards? Are you losing weight, and if so, how much? Do you want to tone up your whole body, or just a specific area? Is it your general fitness you want to improve? What is your timeframe, and is it realistic? Two stone in two months might theoretically be possible, but not using any methods recommended by healthcare professionals. If you’re looking to make considerable changes, you need to give yourself the best part of a year to embed new routines, habits and to see the real benefits, although significant weight loss can be achieved in shorter periods. If you like the idea of personal training but can only fit in one session a month, you’ll be relying heavily on your own willpower and motivation to keep you on track for the other 30 days – only you’ll know if that’s feasible. As I said above, making changes to your fitness lifestyle takes a fair bit of commitment; otherwise you’ll end up feeling disheartened and disillusioned. Of course, personal trainers don’t come with the hefty contracts and fees that are associated with gym membership, so if you find it isn’t the path for you then at least you’re not trapped in a long-term situation. If you think that female-only personal coaching is the way forward, then get in touch today to discuss your training options. Please do note that I work exclusively with female clients in and around Derbyshire on a one-to-one basis, allowing me to concentrate on offering focused, individualised advice and support to the ladies in my portfolio. For more information on the different options Female Personal Trainer Derby provides, take a look at my pricing page. This is on an individual basis; however, many people find exercise more enjoyable if the experience is shared. If you’d like to be trained jointly with a female friend or family member then this can be arranged, providing both participants are from the Derby area. Training with one other person is £20 an hour each and with three people is £15 each. If you have any questions regarding the kinds of exercise plans I offer, or any other queries about my services as a female personal trainer within Derby, please use the contact form below.